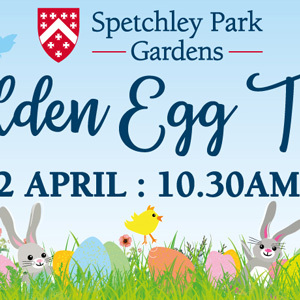 Golden Egg Trail, 17 – 22 Apr, Spetchley Park & Gardens, Spetchley, Worcs. Join in on this annual Easter egg trail around the Gardens. Solve the puzzle and collect an Easter treat. Surrounded by ancient parkland, deer park and lakes, this historic garden is set in the wonderful Worcestershire countryside with far reaching views to the Malvern Hills. The ideal day out for you and your children to have the dream escape from the bustle of everyday life!